In previous tutorials on drawing shapes in Photoshop, I mentioned that there are three very different kinds of shapes we can draw using Photoshop's various Shape tools. We can draw vector shapes, we can draw paths, or we can draw pixel-based shapes. In this tutorial, we'll look more closely at the main differences between vector, path and pixel shapes and why you'd want to choose one over the others. Selecting the Ellipse Tool from the Shape tools fly-out menu. Once we've chosen a Shape tool, we need to tell Photoshop which type of shape - vector, path or pixels - we want to draw, and we do that using the drawing mode options in the Options Bar along the top of the screen. From left to right - the Shape Layers, Paths, and Fill Pixels options. Of the three types of drawing modes, the one we almost always want to be working with is Shape layers (vector shapes). When most people think of drawing shapes, they're not thinking of paths or pixels. They're thinking of vector shapes, the same type of shapes we'd draw in Adobe Illustrator or most other drawing programs. Photoshop itself is not really known as a drawing program. It's primarily a photo editor, and photos (digital photos, at least) are made up of pixels. When we draw a pixel-based shape by choosing the Fill Pixels option in the Options Bar, we're creating shapes out of the same type of pixels that make up a digital photo, and pixels have major limitations on what we can do with them. The biggest drawback with pixel-based images or shapes is that they don't scale very well, at least not when we need to make them larger than their original size. Enlarge a pixel-based image or shape too much and it will lose its sharpness, becoming soft and dull. Enlarge it even more and the pixels that make up the image or shape can become visible, resulting in a blocky appearance. Pixel-based images and shapes also depend very heavily on the resolution of your document if they're going to look good when you print them. They may look great on your computer screen, but printing high quality images requires much higher resolution than what your monitor displays, and if your document doesn't have enough pixels to print it at the size you need with a high enough resolution, it will again look soft and dull. Vectors, on the other hand, have nothing at all to do with pixels. They're actually made up of mathematical points, with the points connected to each other by either straight lines or curves. All of these points, lines and curves make up what we see as the shape! Don't worry about the "mathematical" part of what I just said. Photoshop handles all the math stuff behind the scenes so we can just focus on drawing our shapes. Since vector shapes are essentially drawn using math, each time we make a change to the shape, either by resizing or reshaping it in some way, Photoshop simply redoes the math and redraws the shape! This means we can resize a vector shape as many times as we like, making it any size we need, without any loss of image quality. Vector shapes retain their crisp, sharp edges no matter how large we make them. And unlike pixels, vector shapes are resolution-independent. They don't care what the resolution of your document is because they always print at the highest possible resolution of your printer. Clicking on the Shape Layers icon in the Options Bar. The Layers panel showing the single Background layer. Clicking on the color swatch to choose a color for the vector shape. Choosing a color for the vector shape from the Color Picker. A circular shape drawn with the Ellipse Tool. Every new vector shape is given its own Shape layer in the Layers panel. A second vector shape now overlaps the original. Two vector shapes, two Shape layers. At the moment, both of my shapes are red, but we can easily change the color of a vector shape at any time simply by double-clicking on the shape's color swatch on the Shape layer: I'll double-click on the second shape's color swatch. Double-click on a vector shape's color swatch to change its color. Choosing blue as the new color of the second shape. The second vector shape now appears blue. The vector shape's color swatch now displays the new color. Selecting the Path Selection Tool. The Path Selection Tool selects whichever vector shape you click on. Here, the red shape is selected by clicking on it. When a vector shape is selected in the document, its Shape layer is highlighted in the Layers panel. Selecting the blue shape by clicking on it with the Path Selection Tool. 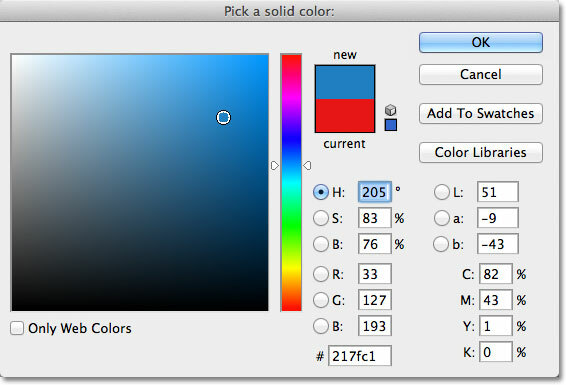 The blue shape's layer is now selected. With a vector shape selected, I could drag it around inside the document with the Path Selection Tool to reposition it (the standard Move Tool would also work), but we can do much more interesting things with vector shapes than simply moving them around. For example, we can combine two or more shapes together to create different shapes! We'll learn how to do that next! Dragging the Shape 2 layer onto the Trash Bin to delete it. The two previously separate shapes are now combined into a single shape. The two shapes now share the same Shape layer. This series of icons controls how two shapes on the same Shape layer interact with each other. Selecting "Subtract from Shape Area". The two shapes with the Subtract from Shape Area option selected. The shapes with the Intersect Shape Areas option selected. Selecting "Exclude Overlapping Shape Areas". The shapes in Exclude Overlapping Shape Areas mode. The second shape has been deleted, leaving only the original shape. Selecting the Direct Selection Tool. Reshaping vector shapes is a bit of an advanced topic which I'll cover in much more detail in another tutorial, but with the Direct Selection Tool selected, I'll click on the outline around the shape, which displays the shape's anchor points (the little squares). We can also see lines with little circles on the ends extending out from some of the anchor points. These are known as direction handles. We can click and drag either the anchor points or the direction handles to change the look of the shape. Click and drag any of the anchor points to change the shape. Photoshop fills the added area with color when I release my mouse button. Dragging a direction handle reshapes the line or curve connecting two anchor points. The shape now looks much different than it did originally. Now that we've had a bit of a whirlwind tour of what we can do with vector shapes, including how editable and flexible they are, let's compare them to paths and pixel shapes, which we'll do next! Starting over with just the Background layer. The outline that Photoshop displays as we're drawing a shape is a path. The path becomes a color-filled vector shape only when we release the mouse button. The Shape layer appears in the Layers panel when Photoshop converts the initial path into a vector shape. Photoshop once again displays only the initial path outline of the shape as I draw it. With the Paths option selected, Photoshop draws only the path outline of the shape, nothing more. Unlike Shape layers, Photoshop does not add new layers when we draw shapes as paths. The reason is that paths are independent of layers. In fact, they're independent of pretty much everything. Paths are vector-based, not pixel-based, which means they're made up of mathematical points connected by lines and curves, and even though we can see them on the screen while we're working in Photoshop, they don't really exist in the document unless we do something more with them. If I was to save my document right now as a jpeg, for example, the path would not appear in the image. If I printed the document, the path would not be visible on paper. We could choose to fill it with a color ourselves, or we could apply a colored stroke to the path, or even convert the path into a selection outline, but unless we do something more with it, a path just sits there waiting for a purpose. Open the Paths panel by clicking on its name tab at the top of the panel group. Renaming the temporary work path. The path is now saved as part of the document. Dragging the path's anchor points and direction handles with the Direct Selection Tool. Hold down Ctrl (Win) / Command (Mac) and click on the path's thumbnail. The reshaped path is now a selection outline. Since Shape layers in Photoshop are just paths filled with color, it's actually very easy to convert a path into a Shape layer ourselves, which can be a handy trick when you meant to draw a Shape layer but forgot that you still had Paths selected in the Options Bar and accidentally drew the wrong type of shape. A circular path drawn with the Ellipse Tool set to the Path drawing mode. Choose Solid Color from the top of the list. Choose a color for the shape from the Color Picker. The path is now filled with color. The path has successfully been converted into a Shape layer. Next, we'll look at the last of the three drawing modes in Photoshop - Fill Pixels - and how they compare with Shape layers when resizing them! Selecting the Fill Pixels drawing mode. The Fill Pixels option is the least interesting or useful of the three drawing modes because with it selected, Photoshop simply draws shapes by filling them with colored pixels, and pixels are not as easily editable or as scalable as vectors. A new blank layer has been added for the pixel shape. Clicking the Foreground color swatch. Choose a new Foreground color from the Color Picker. Drawing a Fill Pixels shape with the Ellipse Tool. The pixel shape looks very similar to a vector shape. The preview thumbnail for Layer 1 shows the pixel shape, which is not easily editable like a Shape layer would be. The Layers panel showing the vector shape and the pixel shape. The Free Transform box and handles appear around the vector shape on the left. Scaling the vector shape down to 10% of its original size. The shapes after making the vector shape smaller. The vector and pixel shape still look very similar after scaling them down in size. Scaling the vector shape upward to 1000% of its size. Vector shapes can be scaled to any size with no loss of image quality. And the winner is.... Shape layers! To quickly summarize, even though Photoshop gives us three different kinds of shapes we can draw, the best choice, and the one you'll want to use most often, is Shape layers. They're vector-based, which means they're based on math, not pixels, and that makes them very editable, flexible and scalable. Paths, also vector-based, are simply outlines of shapes with no color fill. They're just as editable, flexible and scalable as Shape layers but are not actually part of the document until we do something more with them. Finally, pixel shapes (Fill Pixels), the least useful of the three, are just shapes filled with colored pixels, with all the normal limitations of pixel-based images. They're not easily editable like Shape layers or paths, and they will lose image quality if you need to scale them larger than their original size. And there we have it! That's our look at the differences between vector shapes, paths and pixel shapes in Photoshop! Check out our Photoshop Basics section for more tutorials on working with shapes, plus layers, selections and other essential skills!